Click on the targets in the map below to find Elabscience products related to the TGF-β Signaling Pathway. TGF-β signaling pathways are involved in many cellular processes in mature organisms and in developing embryos including cell growth, cell differentiation, apoptosis, and cell homeostasis. When the activity of each member of the TGF-β signaling pathway is not activated, multiple cancers spontaneously develop in the body, indicating that directional regulation of stem cells from TGF-β also has an indispensable function for the formation of cancer. Although TGF-β regulates many cellular processes, these processes are relatively simple. TGF-β ligands bind to TGF-β type II receptors, and TGF-β type II receptors recruit and phosphorylate TGF-β type I receptor combinations to form dimeric receptor complexes, TGF-β Type I receptors rephosphorylate receptor-associated SMAD proteins. The TGF-β superfamily contains nearly 30 growth and differentiation factors, including TGF-βs, Activins, Inhibins and BMPs. The downstream transmembrane TGF-β receptors are multiple SMAD proteins which are important regulators of signal transduction in the TGF-β superfamily and are regulated in a variety of ways at different levels. 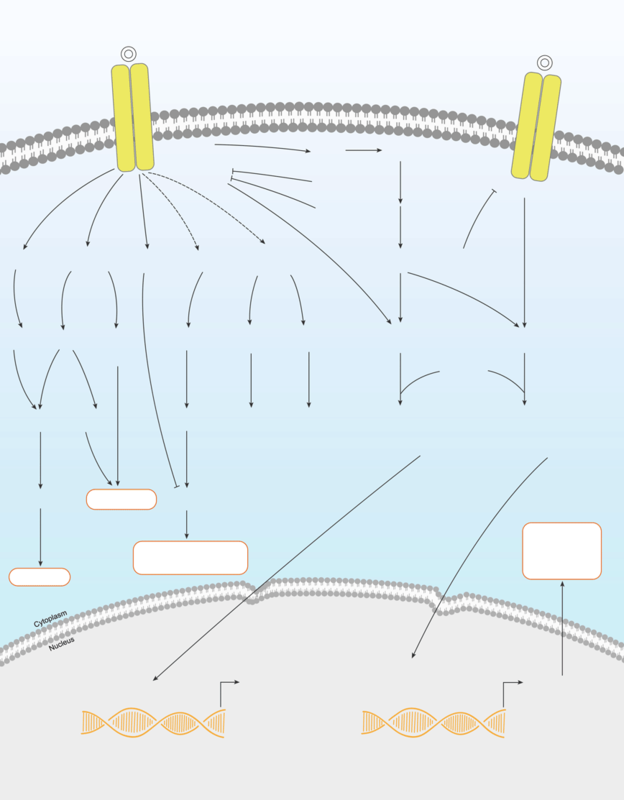 SMAD protein is phosphorylated in cytoplasm, then enter nucleus and aggregate to regulate the expression of target gene.